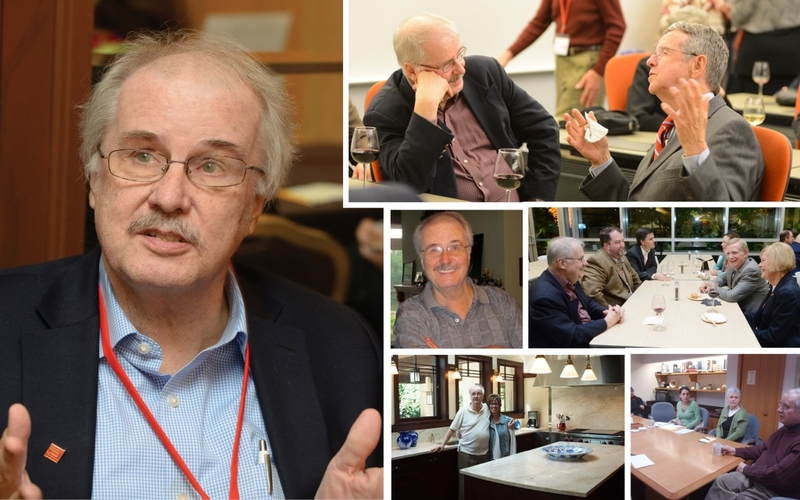 When our friend and longtime board member, architect and preservation advocate John G. Thorpe, died in January 2016, his family asked that contributions in remembrance of John be directed to historic preservation organizations. In recognition of John’s extraordinary contributions to Wright’s built legacy, the board of the Frank Lloyd Wright Building Conservancy has just voted to set up a program fund in John’s name to provide a stipend underwriting costs for graduate students in architecture and related fields or young practitioners to attend the annual Conservancy conference, where they can deepen their understanding of Wright’s work through presentations and by directly experiencing Wright’s architecture. Contributions may be made online by clicking the Donate button on the homepage (please note “In remembrance of John Thorpe” in the comments field), by using this mail-in form, or by calling the Conservancy office during business hours at 312.663.5500. The first Thorpe Fellows will attend the 2016 conference in San Francisco. John G. Thorpe, architect and dedicated preservation advocate, died Monday, January 25, 2016, in Oak Park, Illinois. He was 71 years old. Thorpe founded his own architectural firm, John Garrett Thorpe & Associates, in Oak Park in 1984 and earned renown as a restoration architect through work on numerous Frank Lloyd Wright houses in Illinois, Indiana, Ohio and elsewhere, including the Frederick C. Robie House in Chicago, the Isabel Roberts House in River Forest, Illinois, and the Arthur Heurtley House, William Martin House and Unity Temple in Oak Park. He was instrumental in the preservation of the Frank Lloyd Wright Home and Studio, serving as author, with Don Kalec, of the master plan for the property’s restoration to its 1909 condition, published as The Plan for Restoration and Adaptive Use of the Frank Lloyd Wright Home and Studio in 1978. He also acted to secure its purchase by the Frank Lloyd Wright Home and Studio Foundation (now the Frank Lloyd Wright Trust), which he helped to found, and to implement its 13-year restoration process. Thorpe was a longtime board member of the Frank Lloyd Wright Building Conservancy who acted tirelessly to preserve existing Wright structures, to formulate plans for their continued use and to provide technical preservation advice to prospective purchasers, homeowners and Wright house museum curators. “Although we cannot thank John enough for his knowledge and his material contributions to the Frank Lloyd Wright Building Conservancy, we will remember John particularly for what he was: a kind, generous and loving individual, willing always to share his commitment to Wright and to architecture with those fortunate enough to know him,” said Conservancy President Edith Payne. Among his many other volunteer efforts, Thorpe was an architectural consultant for the Ernest Hemingway Foundation of Oak Park and served on the board of the Pleasant Home Foundation, providing strategic and practical planning related to the restoration and preservation of the George W. Maher-designed National Historic Landmark house in Oak Park. He was the first docent at the H.H. Richardson-designed Glessner House in Chicago when it first opened for tours in 1971. Thorpe has received many awards, including the national and Chicago chapter AIA Honor Awards for his restoration work on the Wright Home and Studio. He received his master of architecture from the University of California, Berkeley, and his bachelor of architecture from the University of Illinois. He previously worked for Skidmore, Owings & Merrill in their Chicago, Washington, D.C., and Algiers offices before starting his own practice. John is survived by his twin brother, Tom Thorpe and his wife Kathleen of Boulder, Colorado; nieces Julie Kerk, Laura Jones and Vicki Cox; nephew Chandler Thorpe and many cousins. In celebration of John’s life and legacy, please join his brother Tom Thorpe and family at a memorial open house on Saturday, January 30 from 11 a.m. until 1 p.m. (with remarks beginning at 11:30 a.m.) at Pleasant Home, 217 Home Ave., Oak Park, Illinois, one of the many historic houses that John worked tirelessly to preserve. The celebration is co-hosted by the family, Pleasant Home Foundation and the Frank Lloyd Wright Building Conservancy. All those who shared in John’s friendship and passions are welcome to attend. In lieu of flowers the family requests that contributions be made to the historic preservation organization of your choice in honor of John.